1 1. What is the definition of an emergency rescue? 3 3. Show three ways of attracting and communicating with rescue aircraft. 4 4. Know six indications for the need of an immediate rescue. 5 5. Know six procedures to follow before moving a victim from a life-threatening situation. 9 9. Know how to properly use a stretcher and carry a victim on a stretcher. Know how to make an improvised litter. 10.4 d. Coil and accurately throw a light and a heavy 50-foot (15.2 m) rope. 11 11. What steps should be taken before reporting a lost person? What information will be needed when reporting a lost person? How is a search for a lost person conducted in a wilderness area? Investiture Achievement Connection: This Honor is related to the Investiture Achievement requirements for EXPLORER Health and Fitness which require completion of this Honor. 1. What is the definition of an emergency rescue? A rescue is the act of removing someone from danger. An Emergency Rescue is a technical term for a rescue taking place under hazardous circumstances and with high risk to the rescue personnel, but must be done immediately to save a person's life. In this type of scenario to say a person is in immediate danger may be understated, normally if not removed from their circumstance as quickly as possible the victim will die quite soon. Technical rescues and rescue are descriptive of many types of circumstances, in all cases the victim is in danger. A cat up a tree or an otherwise uninjured person stuck in a crashed car are not likely to die in moments but will need to be rescued from their circumstance by someone with the means and skill to do so. First, do not touch a person who comes into contact with a live electric wire. If you do, the electricity will also flow through your body, and there will be two victims instead of one. Instead, if you can quickly turn off the power source, do so immediately. If it cannot be turned off quickly, try to knock the wire off with something that does not conduct electricity, such as a shoe (take it off first), a wooden broom handle, or a wooden chair. Once the victim has been separated from the electric power source, check for breathing. If the victim is not breathing, begin artificial respiration (mouth-to-mouth). In a fire, a person is far more likely to die from smoke inhalation than from exposure to flames. There are two things to remember about smoke: it rises, and if you inhale enough of it, it will kill you. Therefore, if you find yourself in a smoke filled room, get down and crawl. If you can, cover your mouth and nose with a wet cloth to help filter the smoke and keep it from entering your lungs. If water is not available, use a dry cloth - it's better than nothing. Make your way to the door and if it is closed, feel it. If it is hot, do not open it, as this means there is fire on the other side. Try to find another way out such as a window or another exit. The first rule of performing an ice rescue is to not run out to the victim. Remember, the ice was not strong enough to hold one person, so it is very unlikely that it will hold you. Before you do anything, call 911. Use a cell phone, or send someone else to make the call. Tell the victim to remain calm, that you are aware of his predicament, and that you are going to help. Then see if there is anything available that is long enough with which you can reach the victim. Possibilities include tree branches, ladders, paddles, oars, shovels, etc. If necessary, you may lay it on the ice and push it out. If you cannot find anything long enough, look for a rope or a rope-like item such as a garden hose or jumper cables. Throw one end of the rope to the victim. As a last resort you may have to venture out onto the ice. But don't just walk out there - lay a ladder on the ice and walk on it. This will distribute your weight over a greater area, decreasing the chances of another break (but not eliminating that chance). When you get to the end of the ladder, roll off, and laying next to it, scoot it out farther. If the ladder still does not reach the victim, get back on it and continue. Do this until you can extend the ladder to the victim. If you cannot find a large object such as a ladder, take something else - anything. You'll need something to reach out to the victim with so that you do not have to go all the way to the edge of the ice hole. This could be your coat for example. Then lay down on the ice - again, you are trying to distribute your weight over a larger area. Scoot over to the victim, and stretch out the item you brought with you, trying to keep your body as far from the edge of the hole as possible. Try to pull victim to safety. Once you get the victim to shore, begin treatment for hypothermia immediately. 3. Show three ways of attracting and communicating with rescue aircraft. Make a distress signal on the ground by piling rocks, branches, or other debris to form large letters spelling "S.O.S." This is the universally recognized signal for help. Try to use materials that contrast with the surrounding environment. In winter, you may be able to stomp an SOS into the snow. Make the letters read from east to west (or west to east) so that the shadows catch the letters better. You may also light three fires to signal for help. Build them either in a line or in a triangle, and get them good and hot. When you see a rescue plane during daylight hours, add green plant matter to the flames. This should cause thick smoke. Be careful to not extinguish the fire by doing this. Punch a cross-hole in its center. Hold the mirror about 3 inches in front of your face and sight through the cross at the ship or aircraft. The spot of light shining through the hole onto your face will be seen in the cross-hole. While keeping a sight on the ship or aircraft, adjust the mirror until the spot of light on your face disappears in the hole. The bright spot, seen through the sight, will then be aimed directly at the search ship or aircraft. 4. Know six indications for the need of an immediate rescue. 5. Know six procedures to follow before moving a victim from a life-threatening situation. The first task is to assess the whole situation and to plan the rescue. Be sure you can perform the rescue without injuring yourself. Make sure that moving the victim will not cause additional injury. Know where you intend to move the victim before lifting him. If bystanders must be used, it is essential that they be briefed in thorough detail on what you want them to do. Unless the danger is immediate, any first aid should be given before moving the victim. If you suspect a spinal injury, do not move the victim. Be sure that it is necessary to move the victim. If it is not, do not move the victim. Know how you will move the victim before trying to move him. Know where you will move the victim before trying to move him. Be sure that you are able to lift the victim before lifting him. If the victim is too heavy, drag him instead. Maintain your balance. Do not start the move from an unbalanced position. Keep your footing throughout the move. 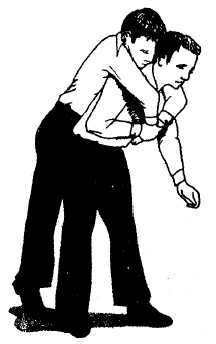 The shoulder drag is accomplished by placing the victim in a supine position (laying on his back), grasping the clothing behind his shoulders, and dragging him in the desired direction. The blanket drag can be used to move a person who, due to the severity of the injury, should not be lifted or carried by one person alone. Place the casualty in the supine position on a blanket and pull the blanket along the floor. Always pull the casualty head first, with the head and shoulders slightly raised so that the head will not bump against the floor. If there are no indications of injury to the spine or an extremity and the victim cannot walk, he can be carried by the Fireman’s Carry The figure here shows the steps of this procedure. Place the casualty in a supine position. Lie down on your side along the casualty’s uninjured or less injured side. Your shoulder should be next to the casualty’s armpit. Pull the casualty’s far leg over your own, holding it there if necessary. Grasp the casualty’s far arm at the wrist and bring it over your upper shoulder as you roll and pull the casualty onto your back. Raise up your knees, holding your free arm for balance and support. Hold both the casualty’s wrists close against your chest with your other hand. Lean forward as you rise to your feet, and keep both of your shoulders under the casualty’s armpits. Do not attempt to carry a seriously injured person by means of the pack-strap carry, especially if the arms, spine, neck, or ribs are fractured. In the support carry, the casualty must be able to walk or at least hop on one leg, using the bearer as a crutch. This carry can be used to assist him as far as he is able to walk or hop. Chair Carry in which the victim is placed in a chair and tilted backward as rescuers lift the victim. This carry requires two rescuers. Rescuer 1: Facing the back of the chair, grasp the back uprights. Rescuer 2: Facing away from the victim, reach back and grasp the two front legs of the chair. Both rescuers: Tilt the chair back, lift, and walk out. A The shorter bearer spreads the casualty's legs, kneels between the legs with his back to the casualty, and positions his hands behind the casualty's knees. The taller bearer kneels at the casualty's head, slides his hands under the arms and across the chest, and locks his hands. B The bearers rise together, lifting the casualty. C Alternate position, facing casualty. The two-hand seat carry is used in carrying a casualty for a short distance and in placing him on a litter. Only a conscious casualty can be transported with the four-hand seat carry because he must help support himself by placing his arms around the bearers' shoulders. This carry is especially useful in transporting the casualty with a head or foot injury and is used when the distance to be traveled is moderate. It is also useful for placing a casualty on a litter. An improvised stretcher made from a blanket. The casualty is placed in the middle of the blanket lying on his back. Three or four people kneel on each side and roll the edges of the blanket toward the casualty, as shown in part A of the figure. When the rolled edges are tight and large enough to grasp securely, the casualty should be lifted and carried as shown in part B of the figure. The three-person hammock carry is very similar to the two-person carry, except that three people are involved: One positioned at the victim's calves, one at the hips, and the third person at the shoulders. The carriers kneel on their knee nearest the victim's feet. The person at the victim's head gives the command, and all three lift the victim to their knees simultaneously. The victim is then turned so that he faces the rescuers. The person at the head then gives the command and the three rescuers stand. 9. Know how to properly use a stretcher and carry a victim on a stretcher. Know how to make an improvised litter. When transporting an injured person, always see that the litter is carried feet forward no matter what the injuries are. This will enable the rear bearer to observe the victim for any respiratory obstruction or stoppage of breathing. Standard stretchers should be used whenever possible to transport a seriously injured person. If none are available, it may be necessary for you to improvise. Shutters, doors, boards, and even ladders may be used as stretchers. All stretchers of this kind must be very well padded and great care must be taken to see that the casualty is fastened securely in place. Stretchers may be improvised by using two long poles (about 7 feet or 2.1 meters long) and strong cloth, such as a rug, a blanket, a sheet, a mattress cover, two or three gunny sacks, or two coats. The figure here shows an improvised stretcher made from two poles and a blanket. CAUTION: Many improvised stretchers do not give sufficient support in cases where there are fractures or extensive wounds of the body. They should be used only when the casualty is able to stand some sagging, bending, or twisting without serious consequences. An example of this type of improvised stretcher would be one made of 40 to 50 feet of rope or 1 1/2-inch firehose. d. Coil and accurately throw a light and a heavy 50-foot (15.2 m) rope. Separate the rope into two equal sized coils, with a little less than half the rope in each coil. Choose one end that you will hang on to, and grasp it firmly in the palm of one hand, using the three smallest fingers to hold it securely. Hold the rest of that coil between the index finger and thumb, and hold the other coil in the other hand. Take aim, and throw both coils toward the victim at the same time while retaining your grip on the end. If you have difficulty with this, try standing on the end of the rope you wish to keep with you. Using this method, you can throw the rope quite a bit farther than if you had thrown a single coil. This is because the second coil will not begin to unravel until the first one uncoils. Practice until you can hit a target with the rope from the 50-foot (15 meter) mark. 11. What steps should be taken before reporting a lost person? What information will be needed when reporting a lost person? How is a search for a lost person conducted in a wilderness area? If at home check your home carefully, contact your child's friends and your neighbors quickly to see if your child is with one of them. If at a store or mall contact management or security and have the child paged, if needed many stores today will "lock down" until all people and places are checked. If in a public place, do not panic. Try a high spot such as a chair or table to get a better vantage, and contact the facility management if there is one. Gather yourself and be prepared to provide information to the police that will be relevant to the search for your child. Adults must be missing for 24 hours and in some places 48 hours before a report can be filed. Contact known friends, work, and hang outs before reporting an adult missing. Adults who are mentally unstable for any reason or in need of medication for survival can normally be reported immediately as missing. If you are expecting loved ones to return from an outing and they are overdue be sure to contact their various phones and their home before calling authorities. If this is travel, some delays may be caused by weather and other circumstances that can be checked by calling the airport or travel authority for their means of travel. Road conditions can normally be checked through the state's department of transportation or the department of public safety (Highway Patrol). For those who were camping, hiking, or the like you will contact the forest/park authority for weather and road issues. Be sure to have information on planned hiking routes and camping locations left behind by your loved ones so they can be used in a search if needed. The more detailed your physical description to police can be the better. The color of eyes, hair and skin are needed but are not truly distinctive. Pictures are best and any identifying marks such as scars will help to identify a particular person quite well. The clothes the missing or lost person was wearing when last seen are very helpful too, as well as details on the vehicle(s) any adults may have been driving when last seen. Age, date of birth, and other personal details such as family nicknames and family known information are helpful in child abduction cases. This information can not only be used to identify a child but to retrieve the child and gain trust with police. The person's doctor and dentist will also be helpful so have those names ready if possible. In wilderness areas searches are conducted in an ever widening circle normally. All available resources are used including hunting dogs, aircraft, search hikers, and mounted search personnel. When a person is lost in the wilderness there is rarely any expense spared in the search for the person. If details are known about intended camping sites and hiking routes then teams will be sent to investigate those locations directly while others are sent into line of site search patterns where from the best known location for the missing person(s) was outward with each searcher being within site of the next. This will also be done in staggered waves so that any evidence overlooked by one searcher might be found by the next. When the area becomes large enough to make line of site searches impractical the teams will be broken into zones using a search grid. A team of two or more will be assigned some small piece of the map area to search, all areas will be searched repeatedly for missed evidence or people. All the while roadways and known paths will have searches, or outposts on them in case the victim is still mobile and trying to work his way out of his circumstance. Aircraft will search in grids as well when weather provides. At night some aircraft may utilize heat sensors to try and identify people in the wilderness, this has proven effective at times and at other times not. When an aircraft identifies a possible victim a search team in the grid will respond to the location, sometimes they find nothing; other times they find animals. If a person is seeking shelter in a very cold area, he may have burrowed deep enough into a location as to defeat the heat sensors on any aircraft as was the case with a child in Arizona who hid among some cactus which cool greatly at night. This particular child had evaded rescuers intentionally for more than a day because he was not supposed to talk to strangers. This page was last modified on 23 May 2018, at 09:49.